In this tutorial, we give an overview of how to test applications which are written using the SAP S/4HANA Cloud SDK. In general, there are multiple kinds of tests differentiating mainly in the granularity of testing. They all have their advantages and disadvantages. A common visualization is the testing pyramid. 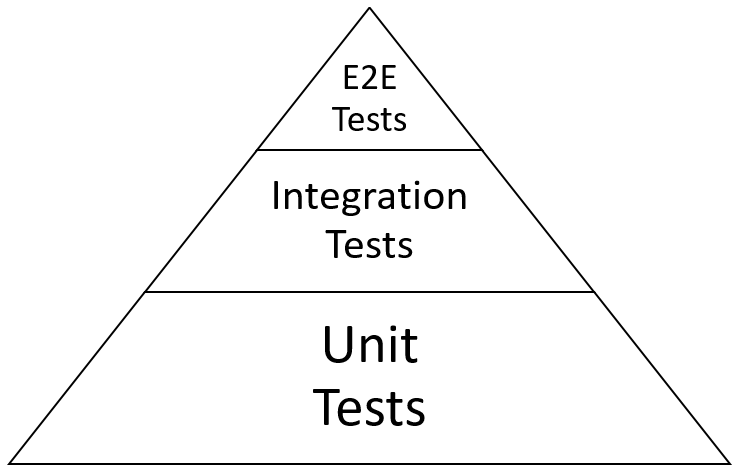 Based on the costs of the tests it visualizes that you should have much more unit tests than integration tests than E2E (End-To-End) tests. The costs for creating, running and maintaining increase while you move the pyramid up. For example, End-To-End (E2E) tests are running on the user interface level. The test executor automatically clicks through the user interface asserting that applications behave in the desired way. Testing on this level shows that the features of the application are working. You could have, e.g., one E2E test per feature or user story. However, E2E tests are expensive to write and execute. E2E tests interact with the browser. This is expensive, because it takes time to start the browser and the browsers loads and renders a lot of resources. In addition, it is usually difficult to specify the interaction with the browser in a way that it can deal with smaller changes in the application user interface structure. Furthermore, E2E tests are sometimes flaky. Imitating the interaction with the browser is error-prone. The browser with changing loading times and asynchronous behaviour creates a quite unstable environment, which is a bad condition for tests. Thus, you should limit their number to a reasonable subset of functionality not tested otherwise. At least the majority of functionality should be already tested by unit and integration tests. Integration tests have a reduced complexity. They skip the user interface and work directly on the defined backend APIs. They test the integration between software modules or systems. In our example, we mainly use them to test the integration between backend services and the integration to SAP S/4HANA systems. Although they have a reduced complexity, they still have medium costs. They still have an overhead, e.g., for network communications or spawning a small server to make the backend APIs available. You should use them to verify that your backend services can communicate with your SAP S4HANA system and to test that the services behave as the user interface expects it. Unit tests have the smallest granularity. They can be defined directly on the programming level, e.g., calling methods of your java classes. Dependencies to other modules or systems may be mocked to ensure that they run very quickly and only test the portion under consideration. These tests are usually very cheap. You should use them to verify that your software modules, such as classes, behave as expected. Frontend Unit Tests with Jasmine and Karma. For the modules of your backend services we suggest writing JUnit tests. The archetype already contains a submodule called unit-tests. Please place your unit tests there. They are in a separate module to make it easier for the pipeline to execute them separately. Furthermore, it avoids that test dependencies become part of the application by accident. This module already contains the JUnit dependency. Unit tests should be very light weight. They should test the modules, e.g. a class, in a isolated manner. Other depended modules or even calls to external destinations, such as an ERP system, may be mocked. For mocking, the SAP S/4HANA Cloud SDK provides mocking facilities with the class MockUtil. Furthermore, we recommend using mocking frameworks, such as mockito or powermock. Take a look at Step 19: Mocking S/4HANA calls to learn more about how the SAP S/4HANA Cloud SDK makes it easy to mock even calls to SAP S/4HANA systems. In the integration tests you can tests your backend services without the frontend application. In the steps 2,3 and 4, we already introduced the integration tests and showed how to set them up. In general, we recommend to use Arquillian to spawn a small server containing only the resources for the specific backend services you want to test. This is faster compared to deploying it to the SAP Cloud Platform first and then testing against the deployed version. Furthermore, you still have the possibility to influence the test execution, e.g. with mocking or to collect test coverage data. For spring, we recommend to use the SpringRunner. For both, there is an example test already included in the corresponding archetype. In this tutorial, we want to focus on the mocking facilities provided by the SAP S4HANA Cloud SDK. When you execute the integration tests locally, they run in a different environment than later on in the SAP Cloud Platform. Therefore, many services, such as the destination service, are not available, as the SAP Cloud Platform provides a much richer environment in terms of services and runtime libraries than the local test environment. This target environment has to be, partially, replicated in the local environment where the mocking facilities allow to test your business application without relying on the provided services locally. Since the SAP S/4HANA Cloud SDK already comes with abstractions for these services, it also offers to mock them in a local environment. Everything around mocking is located in the class MockUtil in the SAP S/4HANA Cloud SDK. Information about the interface and the available methods can be found in the JavaDoc. mockCurrentCloudPlatform() Mocks the SAP Cloud Platform environment, i.e. the application name. The Default application name is testapp. mockAuditLog() Makes the audit logger locally available not to cause run-time problems. The default behavior is to forward the logs to the standard logger. As result, you can get platform specific information such as tenant or user information although you are not in a SAP Cloud Platform environment. Furthermore, this is the basis to mock destination such as the connection to an ERP system or other external services. //from command line or file. To pass the credentials over the command line you can use the command line parameter -Dtest.credentials. The value of should be a json string in the same format as in the file. Please be aware that, if you pass the credentials over the command line, the credentials might be persisted in the history and others might see it. If you decide for a file, you don’t have to enter it again for every test. However, be aware, that you should restrict the access and add the file to your gitignore. Mocking an ERP system uses the same mechanism. However, in addition you also have to provide a system id and a client id in addition to providing the systems as above. You can use either SapClient.EMPTY if the default client of a host is fine, or you use the convenience method ErpSystem.builder() that does not require a client id. //for alias from command line or file. In accordance to this, the system.yml with ERP systems looks as follows. In cloud system do not need to specify systemId and sapClient. There is even a short form of the code, because the destination name and the alias are optional. If you don’t provide a destination name, the destination name will be taken from ErpDestination.getDefaultName(). The default destination name is ErpQueryEndpoint. The alias will be taken from the default system in your systems.yml. The code uses jQuery to send a GET request to a backend service of your application. It returns a promise for the list of business partners. Replace the jQuery.get(...) with: BusinessPartnerService.getBusinessPartners(). In Jasmine each test is wrapped into an it block. In this case it is an asynchronous test. First we mock the call to the backend in the spyOn method by overwriting the method jQuery.ajax. Then we call the BusinessPartnerService implemented in the file before. In the callback we evaluate the assertions and mark the asynchronous test execution is completed. We place the test in frontend-unit-tests/tests/service/businesspartners.jasmine.js. In order to execute this test you can either create a new html page which executes the tests or you can use karma. We will use karma to be able to run the test from the command line. To run karma you have to install nodejs and create a package.json in the root of your project. 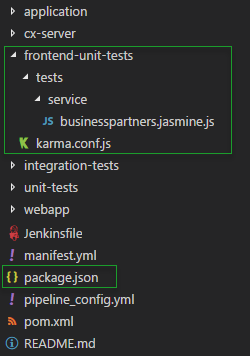 "ci-test": "karma start frontend-unit-tests/karma.conf.js --watch=false --single-run=true"
In the scripts section you define the command ci-test which is used to run the unit tests with karma. In the section devDependencies you specify the dependencies needed to execute the tests. You install them with running npm install in a terminal window. First, we define the base path, which is in our case the project root folder. In the openUi5 block, we can define where the resources for SAP UI5 are located and can be downloaded from. In the client block you can define the resource roots for your application components, as you also do it in your index.html of your SAP UI5 application. Please note that the path has to have ./base/ in front and then points to the folder where your frontend code is located. It is not in the actual path on the file system. In the files section you specify the location of the files that you need for testing. By default all files are loaded to execute the tests. Thus, we specify for the application code that it is not included but served when required in a test. In the reporters section, we specify that we also want the results to be stored in the junit format and that we also want the code coverage data to be stored. These reporters are defined in the remaining sections. In preprocessors we define that all js files should be preprocessed to allow computing the code coverage. The format and the location of the junit and the code coverage reporters are specified in the sections coverageReporter and junitReporter. Now you can run the following commands in the root folder of the project to execute your tests. It will start a chrome instance and execute the tests. In an delivery pipeline everything is usually executed without a user interface. Thus, opening a normal browser would not work. However, most browsers also offer a headless mode. The browser is started without a user interface. Note that you can run the script also with a headless browser: npm run ci-test -- --headless. For the E2E tests we use nightwatch-cucumber. It runs your tests using the chrome driver in the browser against a running version of your application. The version can run locally or in the SAP Cloud Platform. Then the title is "Business Partner Explorer"
We place that file in e2e-tests/features/businesspartner-app.feature. This configuration file defines some constants and places where the reports are located. Please note, that we use the folder s4hana_pipeline/reports to store all reports. This path is later required by our pipeline. In launch_url you can see that that the URL tested against can be defined as command line argument. Furthermore, in the cucumber arguments we import the timeout.js which is located in the folder e2e-tests. It defines the default timeout of the tests. Now you can run the following commands to execute your tests. Note that the launch URL must be unprotected as we have not yet implemented a login step – Step 21: End-To-End Tests Against Secured Applications explains how you can also target apps that require authentication. Now you know how to write various kind of tests for your application. In the next tutorial Step 14 about the SDK we show you how to execute these tests in a build pipeline before you deploy your application to the SAP Cloud Platform. Thus, writing tests is very important to ensure a high quality of your application. Please already note that the pipeline will enforce that most of your productive code is covered by unit or integration tests. It will check the amount of productive code tested with unit or integration tests. Are you facing a development question? Then check out Stack Overflow for SAP S/4HANA Cloud SDK related questions. If you do not find an answer, feel free to post your question and make sure to attach the tag ‘s4sdk’. Our team, as well as the whole Stack Overflow community, are at your service and will quickly react to your question. For an overview of SAP S/4HANA Cloud SDK related questions, go to https://stackoverflow.com/questions/tagged/s4sdk. You think that you found a bug in one of our Continuous Delivery artifacts? Feel free to open an issue in our Pipeline GitHub repository on https://github.com/SAP/cloud-s4-sdk-pipeline/issues. Thanks for posting this blog. When I tried to implement this with the source code provided, It is throwing an error, package io.restassured.module.jsv does not exist. Thanks for question. Please have a look into the blog post step 4. It is describing the details around the test shown here.